The Johnson family had been members of Temple Beth Emet in Burbank, CA in 2009 when Lacy's father, Jon Matthew Johnson, told the congregation that Lacy was sick with cancer and needed expensive medical treatment. 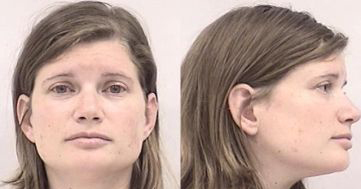 Lacy and her father signed a document with the Temple, frauduently attesting that Lacy had Stage IV breast cancer. 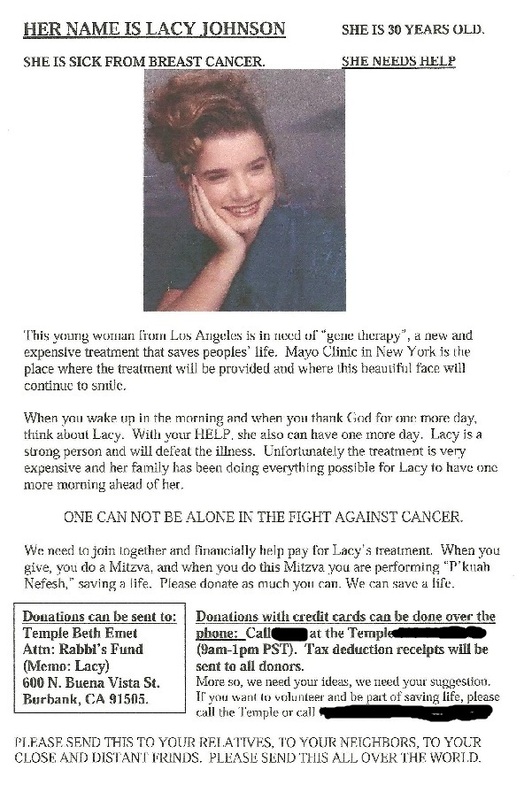 As a result, the flier to the right was created and passed out to the members of the Temple asking for financial contributions to help pay for Lacy's treatment. Some members made monetary contributions to the Temple. Others gave cash directly to Jon. Soon after, the Temple reached out to the Johnson's for an update regarding Lacy's treatment. However, Lacy and Jon disappeared with all the contributions given to them by the Temple and its members. Lacy Johnson does not, and has never had cancer. If you contributed money through this temple please contact us immediately.